War has been declared last week by Imam Raed al Danna against Israel. He's an Imam from East Jerusalem at the Al Aqsa Mosque. He called all the surrounding Muslim nations to destroy Israel. This Imam announced this while visiting in Milan, Italy at a Muslim conference. He emphasized Egypt and Jordan, nations that have peace pacts with Israel to liberate the land from the Jews. He is waiting for a legion of conquerors to take over Israel. The leadership of this mosque had been in the hands of Muhammad Ahmad Hussein, who was expected to avoid controversy and self-aggrandizement. Now he serves as the 7th and current Grand Mufti of Jerusalem.The appointment came from Abbas. On January 9, 2011, while addressing a crowd at an event marking the 47th anniversary of the founding of Fatah, Hussein quoted a controversial hadith (saying attributed to the Prophet Muhammad), stating: "The Hour will not come until you fight the Jews. The Jews will hide behind stones or trees. Then the stones or trees will call: O Muslim, servant of Allah, there is a Jew behind me, come and kill him." Hadiths supposedly have been written by people after Mohammad's death. That could be why this is controversial. This one makes very good anti-Semitic propaganda used to instigate war. The site has been a place of unrest lately. Just before Passover on Monday April 14th, the Israeli police had to limit attendance at Al-Aqsa because of the fear of more violence after clashes happening over the weekend. Security measures taken are that the men under 50 couldn't attend. Neither could any women until a security assessment of the possibility of more disturbances had been taken. What can they expect after this announcement by the head Imam? 5 people were arrested on Sunday during a clash. Muslim rioters threw stones and many Molotov cocktails. Police officers responded with stun grenades. Members of Hamas were were in the crowd, probably leading the protesters. They had to pick Passover to riot! During major Jewish holidays, when Muslims prefer to attack, the military blocks the road to Israel from Judea-Samaria for 48 hours from midnight. Entry would be permitted only to medical, humanitarian and exceptional cases. Jews are getting anxious to be able to pray at the holy site where the Temple once stood, but cannot get near it or be seen moving their body back and forth while standing in prayer by the Muslim guards. Moshe Dayan in 1967 gave permission to rule on the site to the Muslim Imam. However, "Chief Rabbinate Council reminded the public that "in view of the fact that the holiness of the area never ceases, it is forbidden to ascend the Temple Mount until the Temple is built. So the Muslims don't allow Jews there and our rabbis say it's not for us at this time as a place to pray. That should keep things peaceful, but many Jews are not aware of this fact and try to get close, and the Muslims lie in wait for it to happen. The Muslims consider the Al-Aqsa Mosque as the "Farthest Mosque" mentioned in the Koran. It infers this is in Jerusalem, but never mentions the word, Jerusalem. This couldn't be since Mohammad, who was the author of the Koran, died in 632 and the mosque was built in the year 705 CE by the Umayyads who ruled in Palestine. The mosque lies along the southern wall of Haram al-Sharif. It has become the 3rd holiest site in Islam and is in the Old City of Jerusalem. This has a silver dome. It sits on the same site with the Dome of the Rock or "Noble Sanctuary." 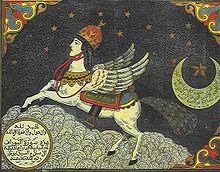 Muslims believe that Muhammad was transported from their Sacred Mosque in Mecca to al-Aqsa during the Night Journey on a flying horse named Buraq. Their tradition is that Muhammad led prayers towards this site until the 17th month after the emigration, when Allah directed him to turn towards the Kaaba. Our Jewish tradition suggests that the change was due to his frustration with Arabian Jews who refused his attempts to convert them to Islam, his new religion. This site is called the Temple Mount on Mount Moriah, the holiest site in Jerusalem, the place where the Jewish Temple stood before being destroyed by the Romans in 70 CE, which was the 2nd time the original Temple had been restored. The First Temple was built by King Solomon, ruler of Israel, who lived from 961 to 920 BCE, dedicated to G-d and as a place to keep the Ark-10 Commandments. The Assyrians attacked and carted away Jews by 722 BCE after destroying the Temple in 721 BCE. The Babylonians then attacked Judah in 597 and 586. Cyrus of Persia (today's Iran) freed them and told them to go back home and rebuild their Temple which they did. Herod was appointed king of Judah by the Romans after he attacked and captured Jerusalem in 37 with the Roman army and he renovated the Temple, but the Romans destroyed it when they seized Jerusalem in 70 CE. It seems to be the custom of Islamists to build mosques over others' religious sites as a show of ownership. The Dome of the Rock, otherwise called the Mosque of Omar, is the one with the beautiful golden dome that stands out in Jerusalem. It was also built in the center of the Jewish Temple area called al-Harim ash Sherif by Caliph Abd al-Malik in about 738. He had it built to replace the temporary building set up by Caliph Omar 100 years earlier. It is situated on the traditional site of Mt. Moriah, too. So Israel has many mosques. There is freedom of religion for the 1.7 million Muslim citizens of Israel. One of these days the 3rd Temple will be built. The location is not known. The Israel police have proved that there is no operational obstacle that cannot be surmounted in order to ensure the rights of Jewish worshipers on the Temple Mount. The Temple Mount has been closed to Jews repeatedly throughout the past year on every major Jewish holiday and day of commemoration, including Tish'a b'Av, (9th of Av), much of Sukkot, Chanukah and most recently, Passover. The closure has become the standard police response to Muslim rioting on the Temple Mount. This week, on Yom Atzma'ut - Israel Independence Day - the police proved that it doesn't have to be that way. Despite intensive preparations already in motion days before Independence Day being made by the Muslim Temple Mount terrorists to successfully pull off a repeat performance of their recent Passover Temple Mount shut-down to all non-Muslims, the police took the necessary measures to foil the Muslims plans and open the Mount for Jews. It was successful.